Whether there is a special occasion or not, it just feels good to be giving gifts to our relatives and friends. Aside from making them feel loved, it also gives us a satisfying feeling since we made other people happy. So if you are the type of person who enjoys giving gifts, here is a guest post about gift with bows from one of our writer friends. If gift-giving is an art form, then wrapping a gift might be the frame on that piece of art. Just as a great painting needs the right frame, the perfect gift also needs the right wrapping, and no matter how much or how little you spent on your gift, your wrapping can make it look like you spent a fortune. 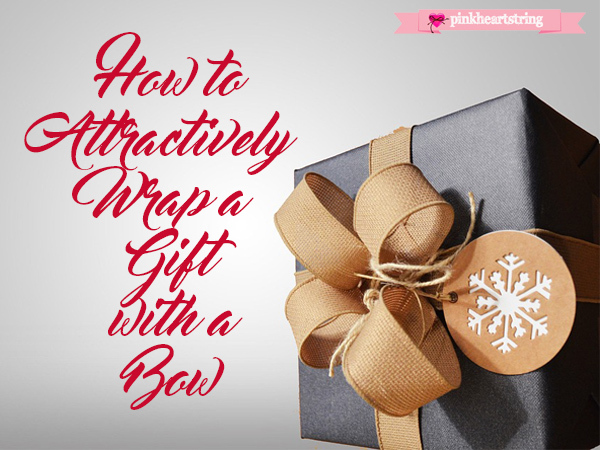 Read on to discover how to attractively wrap a gift with a bow! If your gift is in a box, that makes the wrapping easier. You don’t have to be an expert with paper and ribbons in order to decorate a box, but you should take a moment to think through your design. For example, you might choose a simple, single-color wrapping paper — or even brown paper wrapping — and then use a bright and colorful bow to make the decoration pop. Alternatively, use paper with a geometric design or a personalized message and keep the bow to a single color. Of course, since you’re using a box, you can eliminate the paper altogether and let the bow say it all for the most focused impact. Many people prefer to use a gift bag. They are convenient and come in all sizes, colors, and patterns. When using a gift bag, you have a couple of options in terms of a bow. You can tie the bag handles together with ribbon and run them along a blade edge to make them curl or tie the ribbon ends together to create a simple bow. If your gift bag is a sack without handles, then tie the sack opening with pretty ribbons and tie the ends into bows. Or, for extra secrecy, roll the top enough so you can staple it closed, and then add a fun and easy pre-made bow. Some gifts don’t fit in bags or boxes — think car, jet ski, bicycle, or puppy. In that case, you’re going to want a bow that matches the awesomeness of the gift. With any living creature, be careful that the bow doesn’t interfere with movement and make sure the puppy (or kitten or guinea pig) can’t eat the bow because that would be a disaster. A simple collar wrapped with ribbon might be your best bet or you can attach a bow to the leash. Just remember, safety first! If you’re giving a car as a gift, look online for an oversized bow with a magnet that attaches to the hood of the car. These bows run around $40, but can be worth it to complete the impact of giving such a dramatic gift. Since the bow attaches magnetically, you can use it over and over. Whether you’re going to a birthday party, a bridal shower, a bar mitzvah, or a retirement party, make sure your gift-wrapping decorations embrace the party theme. You can find pre-made bows in all the colors of the rainbow and decorated with hearts, polka, dots, stripes, and geometric patterns. You can also make your own bow using a pretty and unique floral ribbon. Sometimes the gift you’re giving won’t show off much of your personality, but the wrapping still can. For instance, if you picked an item off a wedding registry because it’s the exact vacuum cleaner or place setting the bride and groom wanted, but it doesn’t reflect anything about you or your relationship with the couple, you can use the wrapping to show off your individuality. Incorporate hearts or stars or specific colors that are meaningful to you. Remember that the gift is for the recipient and should be something he or she will love. If, for whatever reason, the gift doesn’t reflect enough of you, then make sure the wrapping does. You may become your family’s go-to person for gift-wrapping. Roy Cunningham is a Los Angeles based blogger with a particular interest in using crafts to add individuality to celebrations and gifts. He’s also an avid hiker, coffee drinker, and dog rescuer. Awesome tips! Will def try this on my gift for my dad this Sunday for fathers day hehe.